Brig. 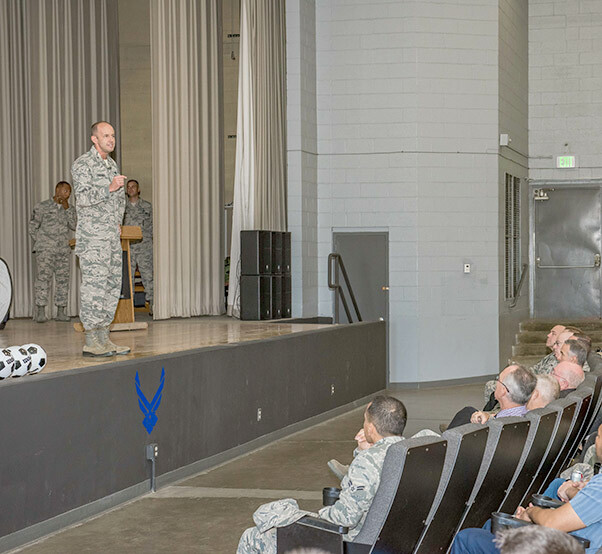 Gen. E. John Teichert, 412th Test Wing commander, addresses a full base theater Aug. 23, 2018, at his first commander’s call. Teichert took command of the 412th Test Wing last month. For continued success at “the center of the aerospace testing universe,” the workforce at Edwards Air Force Base, Calif., must maintain its focus on what it does for the war fighter and inspire innovation. That message was delivered at two commander’s calls held by Brig. Gen. E. John Teichert Aug. 23 at the base theater. 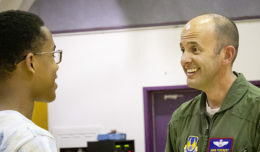 Teichert took command of the 412th Test Wing last month. Two commander’s calls were held for maximum attendance and were done in conjunction with the test wing’s second quarter awards ceremony. The general emphasized the importance of the work done at Edwards and vowed they would hear two reoccurring themes during his tenure here. Focusing on the test wing’s duty to America’s war fighter is Teichert’s second reoccurring theme. Brig. 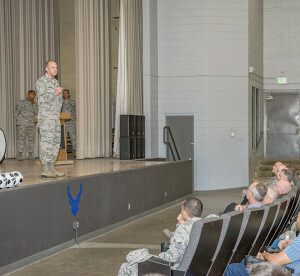 Gen. E. John Teichert, 412th Test Wing commander, addresses a full base theater Aug. 23, 2018, at his first commander’s call. Teichert took command of the 412th Test Wing last month. He was accompanied by Chief Master Sgt. 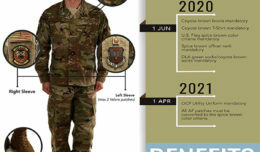 Roosevelt Jones, 412th TW command chief (left). The new wing commander stressed that innovation is key to remain the world’s premiere flight test organization. Teichert was accompanied on stage by Chief Master Sgt. Roosevelt Jones, 412th TW command chief, who echoed the commander’s challenge of innovating. He said in order for innovation to work, “road blocks” must be eliminated from interfering with the flow of new ideas. 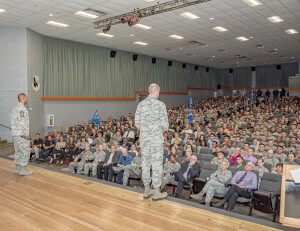 After passing out the second quarter awards and honoring major command winners and nominees, Teichert and Jones wrapped up the commander’s call with a question-and answer-period.